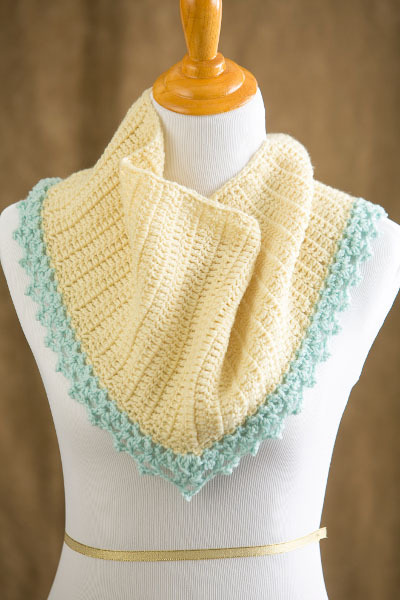 This simple shawl pattern is easily modified for different seasons. The long, isosceles triangle shape makes it easy to wrap around the shoulders. Double crochet 2 stitches together (decrease) (dc2tog): *Yo, insert hook in next st, yo and draw up a loop, yo and draw through 2 loops. Repeat from * once more. Yo and draw through all 3 loops. Double crochet 4 stitches together (decrease) (dc4tog): *Yo, insert hook in next st, yo and draw up a loop, yo and draw through 2 loops. * Repeat from * to * 3 more times. Yo and draw through all 5 loops. Shawl is crocheted side to side in increasing rows to midpoint, and then decreasing rows to opposite edge. Adjust the size by changing the length to the midpoint. 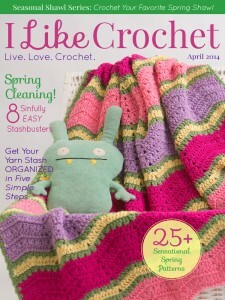 Edging is crocheted in rounds and then rows. Ch 2 at beginning of rows does not count as stitch. Move up markers for each round/row of edging. Row 3: Turn, ch 2, dc in same st and in each st across. 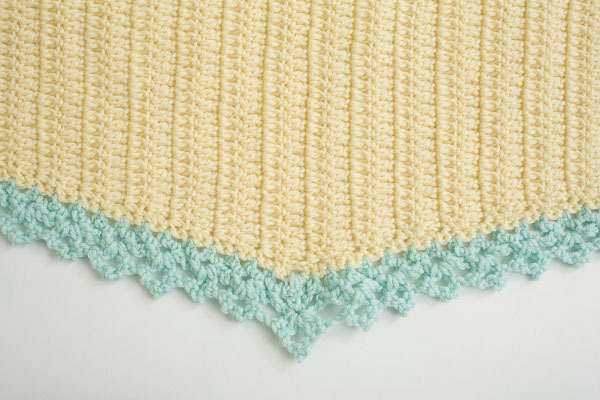 Rows 5-60: Repeat Rows 3 & 4 28 times, or until shawl measures approximately 28” (71 cm). Row 61: Turn, ch 2, pm around turning ch to mark center row, dc in same st and in each st across. Row 63: Repeat Row 3. Repeat Rows 62 & 63 until 4 sts remain. Final Row: Turn, ch 2, dc4tog, do not fasten off, pm in dc4tog to mark edge. Rnd 1 (RS): Turn, ch 1, begin worked along angled edge, 2 sc in edge of each row to center marked st, (2 sc, ch 2, 2 sc) in edge of center row, 2 sc in edge of each row to beginning marked st, sc in first ch, turning to work along long straight edge, 2 sc in edge of each row to first st, sc in same st, fasten off MC. Row 1: With RS facing, join CC with sl st to last st of Rnd 1, ch 1, sc in same st, *ch 3, skip 1 st, sc in next st* across angled edge to marked ch-2 sp, (3 dc, ch 3, 3 dc) in ch-2 sp, sc in next st, repeat from * across to marked st.
Row 2: Turn, ch 4 (counts as sc plus ch-3 sp), *sc in next ch -3 sp, ch 3 across to last ch-3 sp, sc in ch-3 sp, ch 3, sc in last sc. Row 3: Turn, ch 1, sc in same st, *ch 1, skip (sc, ch-3 sp, sc), in next ch-3 sp work (dc, ch 3, sl st to first ch, ch 2, dc)* across to center, skip 2 ch-3 sps, (2 dc, ch 3, sl st to first ch, ch 2, 2 dc) in center sc, skip 2 ch-3 sps, repeat from * to * across, ending with sc in first ch of ch-4 st, fasten off CC. With tapestry needle, weave in ends. Wet or spray block. I’m struggling with pain. Can you suggest some exercises? I am not sure if what I’m doing is helping or hurting.